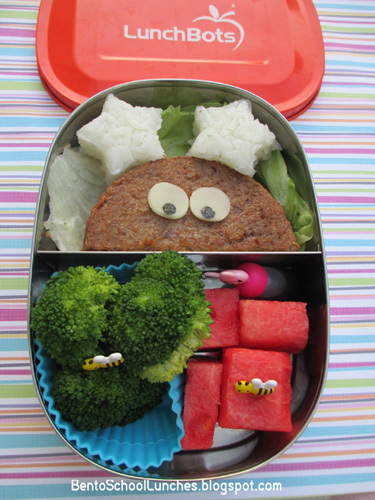 In this bento: The top section contains a MorningStar Farms grillers veggie burger (halved) with provolone for eyes, nori(seaweed) for pupils, two star shaped onigiri, all on lettuce leaf. The bottom section contains blanched broccoli florets which is now his favorite veggies and watemelon cubes. Small bottle of soy sauce. First time I am sending soy sauce with him to school. Packed in LunchBots Duo.